Stop using dangerous aerosol cooking sprays and hard-to-clean basting brushes. Now there's a healthier way to mist salads, vegetables, and frying pans! Ideal for low-fat, high-flavor cooking, the Oil Mister is crafted from durable materials in an ergonomic shape that makes misting easy and mess-free. This elegant mister spreads a light, even coating of any oil with the push of a button. 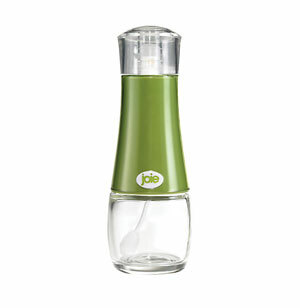 It's an eco-friendly alternative to aerosol cooking sprays and hard-to-clean basting brushes.